If you are a regular follower of D101 Games you’ll have noticed the last State of Address was back in 2016, and that things have been a touch wobbly since then. 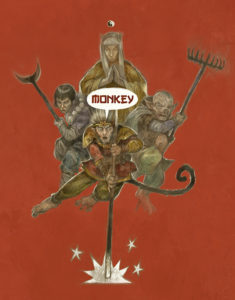 Monkey was kickstarted in the first couple of months of 2017, followed by its mega-adventure the Mandate of Heaven, which was a great payday for D101 and put enough money aside to get the books done. All plain sailing from here you would think. In June I left full-time employ to go full time with D101 working from home (cynics would say that I was becoming a House Husband  ). All good and I was just settling in, when the wheels came off the bus. In July my mother in law was suddenly hospitalised and did not get home until the end of the year. During which time my family, was my priority and D101 became an occasional concern. It wasn’t until almost April 2018 that things had settled down at home and I could seriously work on Monkey, other outstanding books (see below). All in all, I lost a good year of work and pay. If you bought a book or supported me with kind words during that period, you have my thanks for helping me through that difficult period. 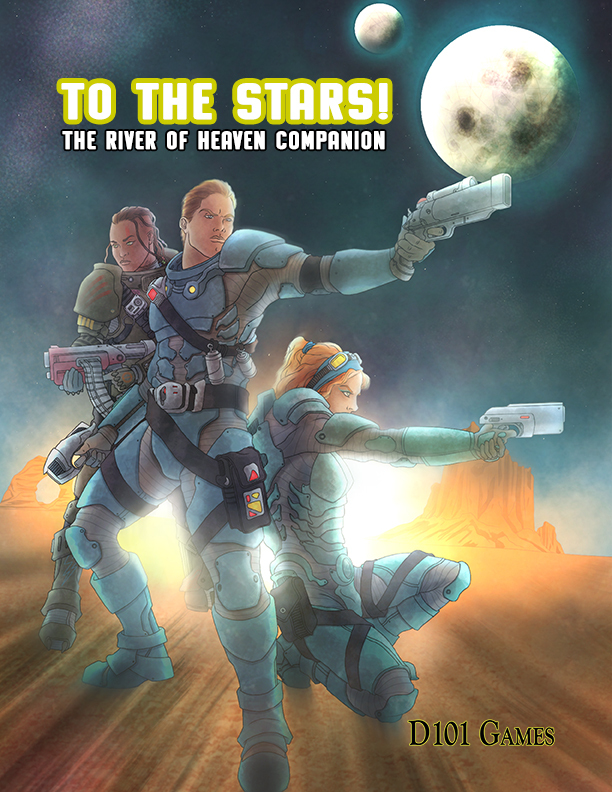 I spent much of last year playing catch up with Monkey, the last of the add on adventures for Crypts and Things Remastered Kickstarter and making steady progress with the long overdue River of Heaven Companion, To the Stars. 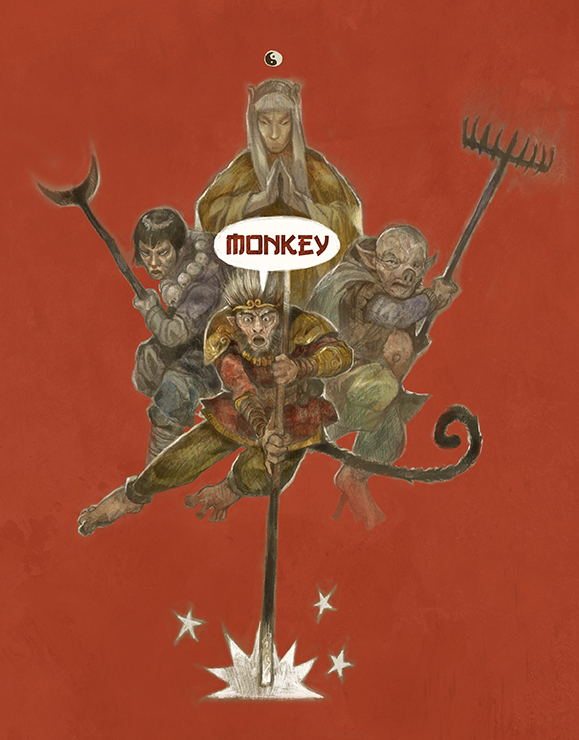 It was also the year that after a five-year hiatus Hearts in Glorantha made a reappearance. After a wildly successful Kickstarter in 2017 the main rulebook and the free Pdf Quickstart was released in towards the end of the first half of the year. This was an auspicious and fantastic moment for me, since its very much a niche game, as far away from D&D’s troupes as you can possibly get, and a project that is very close to my heart. So it was awesome to see it out in the wild, and hold the hardcover, crammed with lovely art from Peter Frain and Dan Barker. I’m now catching up writing the supplements; the mega adventure the Mandate of Heaven (which is at first draft stage), the short mini-campaign The Ministry of Thunder (which is the final stages of writing), The Golden Book of 101 Immortals and the Monkey Companion (a book of extra rules and adventures), all of which I’m getting out this year. 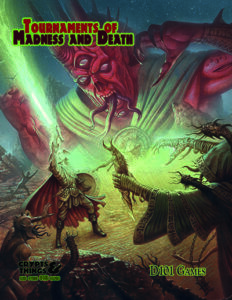 Two issues of Hearts in Glorantha were released in 2019. Issue six was the resurrection issue after a five year hiatus and issue 7 was our tenth anniversary issue We featured scenarios and articles for all the published systems; Guy Milner provided his Beard of Lhynkor Mhy for 13th Age Glorantha, Stewart Stansfield provided an Anti-Hero Lunar Duck for RuneQuest Glorantha and I wrote a duo of RuneQuest Classic adventures Duck Hill in issue 6 and The Temple of the Golden Gorp in issue 7. 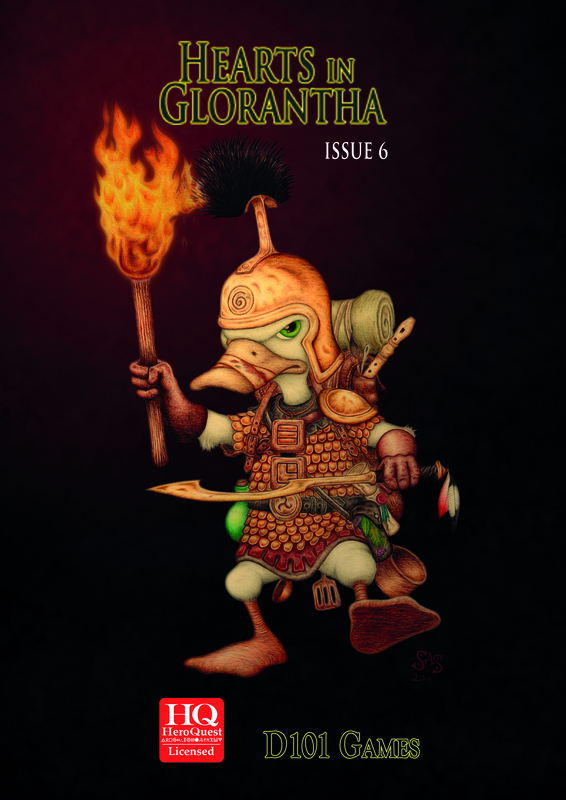 It was heartening to see the surge in interest in Hearts in Glorantha, due to the availability of new Gloranthan games and material from Chaosium Inc, and new names alongside the familiar contributors to the magazine. On a sad note Glorantha Creator Greg Stafford passed away at the end of the year. Greg was a firm supporter of Hearts in Glorantha, who contributed a few one pagers on magic (featured in HiG 1-5 collected) in the early days as encouragement, and his warm words of support will be missed. Want to try out Crypts and Things in a quick 3-4-hour scenario? Have your adventurers race to save the world of Zarth from a great evil? Then this book that came out in September, which features two such scenarios and a guide of how to write C&T convention scenarios is what you want. 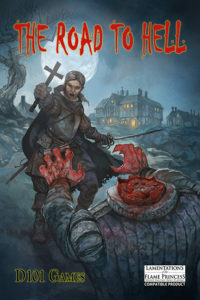 In the last quarter of 2018, D101’s coffers were in need of filling and I struck upon the idea of doing a quick Halloween Themed adventure, and the Road to Hell (which was previously an OpenQuest adventure published in OpenQuest Adventures) was 80% of the way there, bar conversion to Lamentations of the Flame Princess (a horror-themed OSR game based of B/X D&D). Currently, it’s in fulfilment to the backers, but will soon be available to preorder via the D101 Web Store. Best way to know when its out Is to subscribe to the D101 newsletter. Despite being free of the concerns of leave allowances, I cut back on my convention attendances. I made a conscious decision not to go the trade shows that require outlay up front, so UK Games Expo and Dragonmeet were dropped from my schedule. I have two firm dates for your diary. On Kickstarter now at time of writing until Feb 25, as part of the ZineQuest initiative. This is your chance to get both the new second issue, which has been gathering dust on my hard drive for a year or so, and the first issue in print. Its already funded, and the first stretch goal (10 new monsters) has also been met. 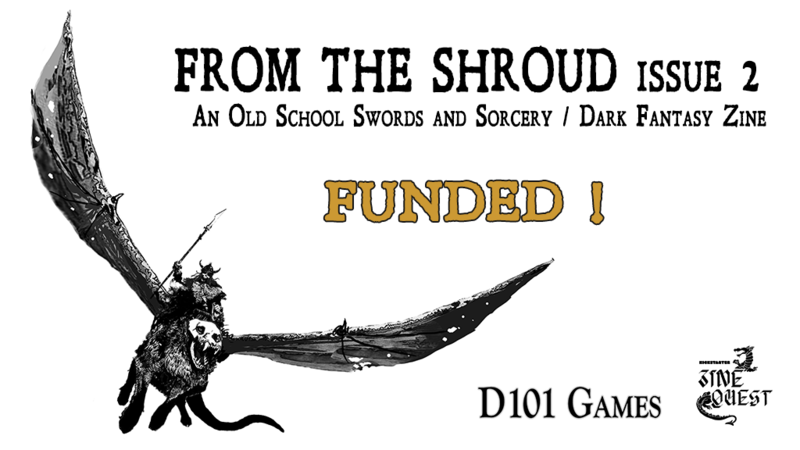 Into the Shroud on Kickstarter now! This is Paul Mitchener’s post-D&D game of fantastic exploration of a series of dimensions by inhabitants of the Empire of Ys. 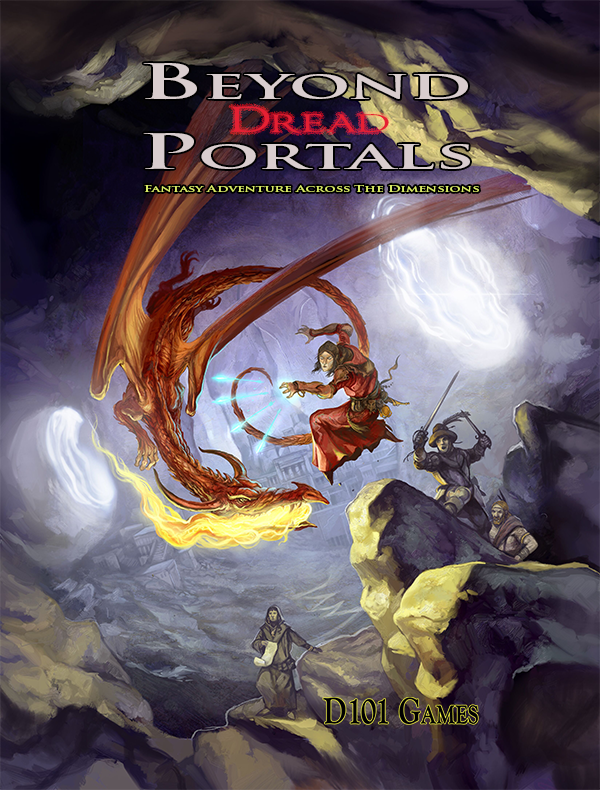 This one has been in development for a couple of years now and it’s a true gem of a D20 game, whose system we’ve christened the Beyond 20 system. Well be getting the whole pool of recent D101 artists on board to illustrate this book, and Glynn Seal (aka MonkeyBlood design, 2018 Golden EnNie Award winner for Cartography) will be doing the many maps that show the worlds that Empire interacts with. Read more on the Sorcerer Under Mountain blog. OQ is ten this year in September. I’m currently playtesting a new version of the game, and gathering a host of talent to illustrate the 10th Anniversary edition, which I want to be the best illustrated version I’ve put out. Once the main rulebook comes out I want it to be quickly supported by a regular release schedule of adventures. Tentatively the Kickstarter to fund OpenQuest 3 will this coming summer Jul/Aug. The long-delayed Companion book is done and to go with its release I’ve revised the main rulebook slightly to take into consideration the small but significant system changes I made to the OQ system in 2016’s OQ Refreshed Edition and another proof-read. Both of these should be out the end of this month or by mid-march latest. After last year’s return to Glorantha, I’ve got more than enough enthusiasm to carry on. Call for contributions for HiG #8 will be made soon, with the aim of getting two more issues out this year. Also one or two issues of Gloranthan Adventures, including Defenders of the Dark (GA #3). I’m currently assessing how to do this given 13th Age Glorantha and RuneQuest Glorantha are now out. These are things that I’m either thinking about doing or have a rough outline or even a partial draft, but they are not 100% done yet. Project Darklight will return, as Reboot. Not 100% on the system yet (strong contenders are Fate or Yin/Yang or even HeroQuest OGL) . At some point, I’ll be sitting down and working it out. I shall be doing something with the soon to be released HeroQuest OGL SRD, starting off with a self-contained version of the Ye Little Book of HeroQuest Fantasy (which was made up of two pdf releases Dungeoneering and Monsters). Beyond Monkey. Once the backlog of supplements coming out of the Monkey Kickstarter is done and dusted, I’ll be doing something more with the Yin/Yang system that features in the game. Front runners are The Water Margin, but that requires me to sit down and do a TON of research so don’t expect anything more than a con game this year, or something else Kung-Fu/Wuxia related. Some thing for D&D 5th. I’ve recently taken the plunge as a 1st Ed/Basic/Expert D&D Dungeon Master and run the game and liked it very much. It’s straight forward for me to run, and even at first level there were lots of fun things for the players to do with their characters. I’d go as far as there were points where the players were running the game themselves! Isle of Death for Mythras. I’ve long been a fan of Design Mechanism’s D100 game Mythras. I’ve now got a framework for releases using that system, and a starter adventure that is full of drama and action. When I sit down to do this, I’ll be previewing and gathering my thoughts on the Sorcerer Under Mountain blog. The return of Fortune. This is our small Fate variant for which we released two-pickup and play small RPGs (everything you need in about 100-150 A5 books) Hunters of Alexandria and The Hollow West. 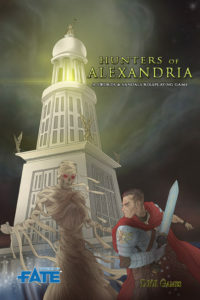 Me and principal author Paul Mitchener have started discussions/planning to get the other various game books we have on our hard-drives out into the wild, and the (strong) possibility of an expanded Hunters of Alexandria. 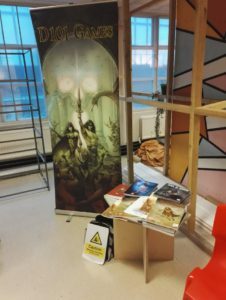 Grogmeet (Fanboy 3, Manchester). Get on the Grogpod and you’ll get an invite to this awesome one-day event at the end of the year. GoPlayManchester (Fanboy 3, Manchester) – this is a monthly meetup I run in Manchester @Fanboy 3. While I’m not trading as D101 there, I do run and run D101 stuff there. I may add more to that list as the year goes on, but the above are dead certs. Neil Benson (aka OldScouseroleplaying on twitter) is running The Road to Hell at UK Games Expo and at Deva Con (Chester). Stay up to date with all the new releases and news from D101 Games, by signing up to our monthly newsletter. Also, I’ll be running regular competitions, prize draws and giving discounts (this month there’s a code for Hunters of Alexandria). I’ve weathered a rough patch over the last couple of years, and D101 Games has proven surprisingly resilient despite me feeling stretched thin at times. This is in no small part due to our supporters and contributors. You have my thanks.